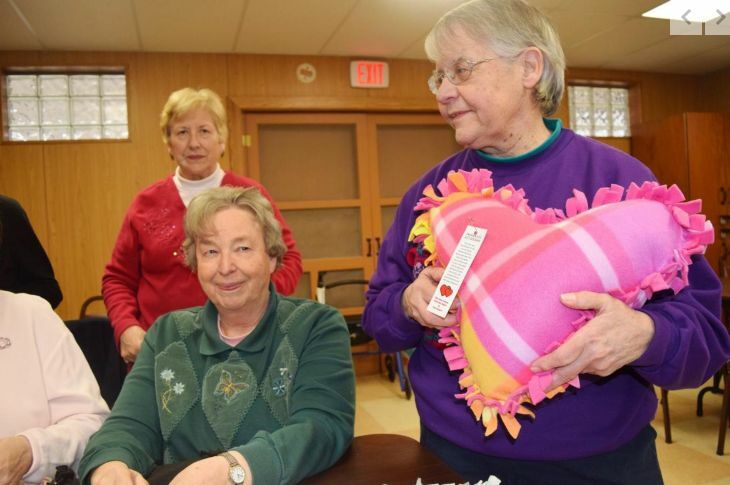 Shirley Leidecker, 74, doesn’t know the foster children who will be receiving the heart-shaped pillows that she and members of the Pillow Blanket Ministry at Macomb’s Immanuel Lutheran Church made for them. But as a mother and grandmother she has a pretty good idea of how the Valentine’s Day gift will make them feel: Loved, Special, and Comforted! Leidecker said the crafting ministry provides parishioners with an opportunity to socialize with a higher purpose. Shortly after the group was started in 2013, the women switched from crocheted blankets to fleece blankets, which was all the rage at the time. Then, with a pattern inspired by Leidecker’s sister, the group started using the leftover scraps of fleece to make heart-shaped pillows. To make it a little more personal each pillow features a tag with a verse of prayer wishing that whoever receives it is kept safe, strong and loved. Recipients of their love are often local hospitals, cancer and dialysis centers, nursing homes and most recently Samaritas. The faith-based charity that’s been sending ripples of positive change into Michigan communities since 1934, provides resettlement services for new Americans, and at-home services and residential communities for seniors and persons with disabilities, through assisted living, skilled nursing and memory care. While some of the pillows made by Leidecker’s group will go to seniors, Samaritas’ Lutheran Adoption Service will distribute more than 1,400 of the colorful and cozy pillows to foster children just in time for Valentine’s Day. This is the first time Samaritas and the Pillow Blanket Ministry have worked together on a project and it’s not likely to be the last.